Do you want a full sized luxury stroller without the full sized luxury price tag and the heavy weight that comes along with that? 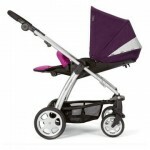 Introducing the Sola stroller, from Mamas and Papas. Mamas and Papas is a popular European brand that has recently started being sold in the US. Generally a picky lot when it comes to te European selection, the Americans seem to be taking a fast liking to M&P. And while product sales are picking up speed here, it is still enough of an unknown to still be able to maintain an air of exclusion and mystery while pushing your super cute stroller around. 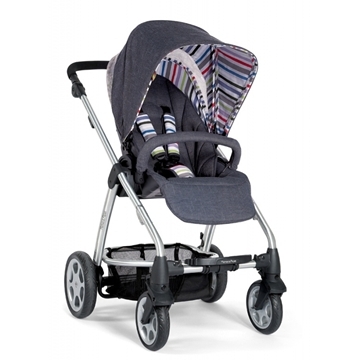 The Sola is a full featured model with the excellent quality and durability that Mamas and Papas is proud of but the price is only $399. One of my favorite parts of the Sola is how easy it is to use and the ultra compact fold. 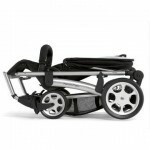 Sola’s seat reverses with one easy motion and unlike most reversible seat strollers, there is a 360 degree recline! Sola’s front wheels are smaller than the back wheels which makes steering easy and smooth. It’s handle adjusts in a circular motion which allows for a more customized fit than the vertically adjustable handles of more expensive models such as the Vista or 4 Rider. 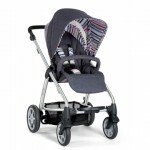 You’ll also love the adjustable footrest, peekaboo canopy window, and convenient toy hook right on top of the canopy. Mama’s and Papa’s also have a similar stroller, the Urbo, which is two pounds lighter but I feel that it does not push as well and is therefore not worth the fact that it is a bit lighter. The one improvement I might suggest would be a bigger basket and a leatherette handle but all in all this is a terrific, high quality stroller and at that price you can’t go wrong!